Trail shoes have become an ever more popular alternative to boots over the last decade, and it’s often said that every 100g saved on your feet is equivalent to 500g in your pack. Without a doubt trail shoes make it easier for many people to walk both further and faster, and in more comfort, with the downsides that they do not last as long as boots nor can they provide as much support (though this largely depends on the torsional rigidity rather than the ankle cuffs). Personally I wear trail shoes in the hills for most of the summer, and wouldn’t even consider wearing boots when walking more defined trails. This increase in popularity means that shoes come in a wide variety these days, ranging from ultra-lightweight shoes built for speed and comfort which often inevitably wear out fast, to heavier, more robust footwear that provides more durability (and possibly more support). These Berghaus shoes fall somewhere in the middle, seeming robust whilst still being fairly light. I’ve been wearing them extensively over the last couple of months, from classic Munro ascents to coastal walks, and on the very steep slopes of Ailsa Craig, and have found the grip and support to be good. 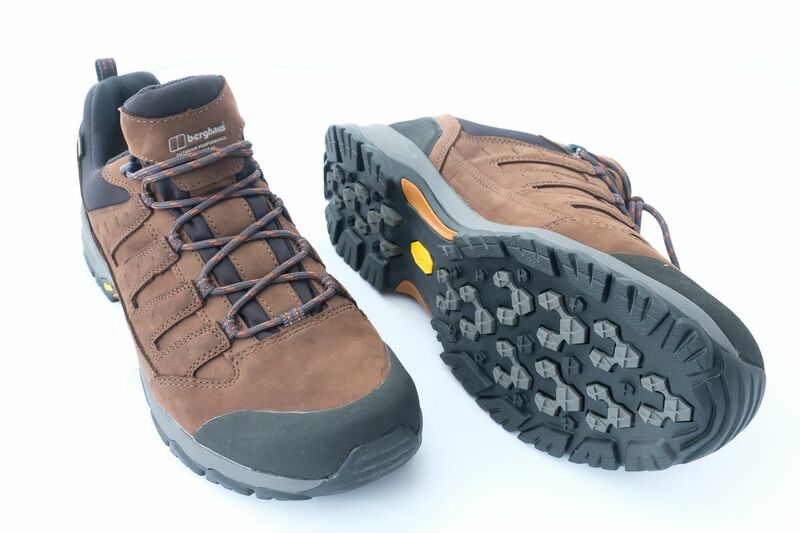 They are very traditional looking, with nubuck leather uppers and moderately flexibile vibram soles, and have a Goretex lining. I’ve seen a couple of pairs of trail shoes split where the toe end flexes over the last year or two, but the quality of the uppers on these inspires confidence that they will be reasonably durable (though not a rival to heavier boots). They show little wear to date, though I did have one lace break – but then you do always carry spares, don’t you?